We are still trying to strip the porch floor. Last time, we detailed a bunch of paint stripping products and techniques, none of which had really worked against the original layer. After that long line of failures and some research, we went in search of new options. Marie from Random Musings suggested we try a heat gun. We have a heat gun, but hadn’t tried it because of the lead in the base layer (heating up lead paint can release toxic vapors). The Kev decided to give it a very brief and well-ventilated go. The heat was very effective on the green paint. JUST LIKE EVERYTHING ELSE! But the green paint is not the problem. The gray layer, though, just turned a bit brown and most of it refused to move. So…no. 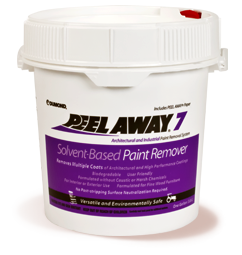 Which is discouraging because we are considering the infrared option, which heats the paint to a lower temperature than a heat gun. If a heat gun won’t budge it, is there any hope for a ridiculously expensive IR gadget? It bears further musing. I brought up the issue at a family birthday party. (There’s only so long you can talk about cake. I’m a conversational saviour!) My dad, who is a private pilot and has restored a vintage airplane, spoke of paint stripper for aircraft and automotive applications. I looked into that and was surprised to find that said stripper could be purchased from regular retailers (in small quantities). She paused, then laughed nervously. Which was semi-alarming. So we put off that purchase, and instead went in search of Peel Away, recommended by Little House on the Corner. We can find it locally, but problem is, it’s always in the Huge Barrel size. That’s expensive, and since we don’t know if it will work, we’ll need to order the Small Tub size online to see if we have a winner. 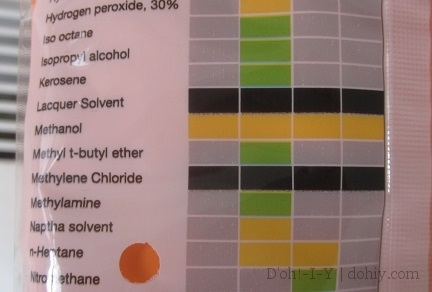 In the meantime, we tried another recommendation, aerosolized methylene chloride. I went in search of one product, but found the Klean Strip version on sale. I reasoned that one aerosolized methylene chloride is as good as another, and picked up the cheap can. I also picked up a pair of gloves. Methylene chloride is awful stuff, and there wasn’t a glove available that was recommended for use with it. So I just bought some thick rubber gloves and hoped for the best. I applied as directed. There was some quick, gratifying blistering, but once I scraped, the base coat remained largely unbudged. I reapplied, waited the full processing time, and scraped again. A bit more gray came off, but there was still a sludgey and immovable mass coating the wood. A third application got a bit more off, but still left a bunch. We just can’t reapply to every square inch fifteen times. That’s under the category Life’s Too Short. Actually, this whole endeavor is tending that direction! Next up, Aircraft Remover and/or Peel Away. Unless anyone’s got another idea — and if so, please let us know! 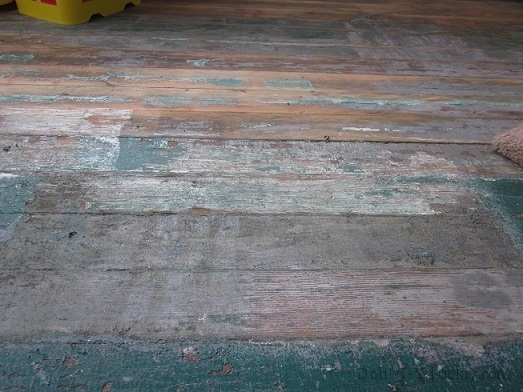 This entry was posted in D'oh!, Porch, Salvage, Walls & Floors and tagged reviews of paint removers, stripping old paint, stripping paint from floor. Bookmark the permalink. I’d sand it, though it’s probably not the best idea when working with lead paint… I’m not sure if you’ve tried it yet, but that’s my suggestion. Oh, and you know, be safe about it – wear your respirator and whatnot. Looking at the pictures you’ve posted, it looks like the paint has soaked into the wood and stained it. I’m not sure that any paint stripper will be able to remove it, as it may have penetrated the wood too much. I personally think, your best bet would be to sand the floor, it took us a weekend to sand about 40m² of very gunked up floorboards, but was so worth it. 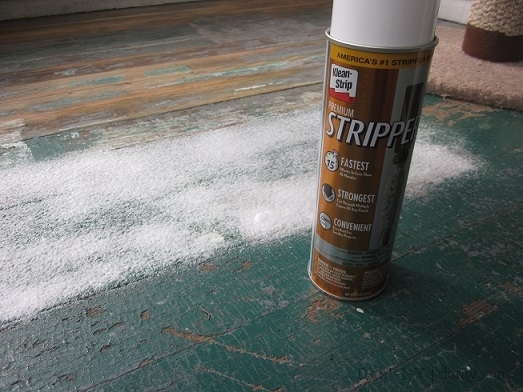 Even if you manage to remove all of the paint with a chemical stripper, you’ll still have to sand everything, so it’s almost like skipping a step. Kathleen and Christine, you both make excellent points. We do intend to sand, but we’re frightened of the lead paint aspect, which is why we’ve been trying to take it off first. I think we might try the Aircraft stuff just for giggles (IT’S HILARIOUS, STRIPPING PAINT! ), but I’ll start looking into safe sanding practices as well. I had a dream about that stupid gray paint last night! Bummer that the heat gun didn’t do the trick, although that spray version of klean strip looks like an interesting product… The NY dept of health folks recommend wet sanding (with a hepa filter) http://www.health.ny.gov/publications/2502/ if y’all end up going down that road. I admire your persistence – if I were in your shoes, I would have switched to paint by now…. 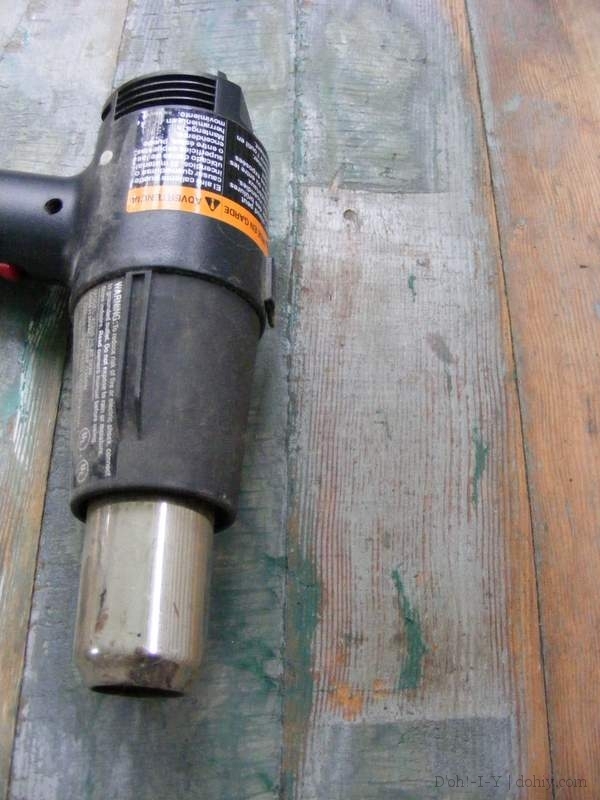 WET SANDING — we had not thought of that! Thanks for the tip! THAT is an idea whose time may have come! We just bought an infrared paint stripper (post to follow) and I have been experimenting with steam, but this paint is TOUGH. Sand might do it! Thanks, Christine. Yeeesh same problem here but mine isn’t 100 years old… waiting to see how you manage it. Good luck!! Still pending…I’m looking to how it’s going to go as well!